Refers to forms that are generated by a continuous curve, traced by a point moving around a fixed point in a fixed plane, while steadily increasing the distance from that point. a plane curve going around a certain point an infinite number of times and approaching or receding from the point on each circuit. If this point is chosen as the pole of a polar coordinate system, then the spiral is given by a popular equation p = f (φ) such that f (φ + 2π) > f (φ) or f (φ + 2π) < f (φ) for all*. In particular, a spiral is obtained if f (φ) is a monotone increasing or decreasing positive function. The equation of the spiral of Archimedes (Figure 1 ,a) has the simplest form: ρ = α<t>. In the third century B.C., this spiral was studied by the ancient Greek mathematician Archimedes, in his treatise On Spirals, in connection with the problems of trisecting an angle and squaring the circle. Archimedes found the area bounded by an arc of the spiral extending from the pole to a certain point and by the line joining the pole and this point. This achievement was one of the first examples of the quadrature of a curvilinear region. The spiral of Archimedes is the pedal curve (seePEDAL CURVE) of the involute of a circle. This fact is made use of in certain drawbridge designs in balancing the variable tension of the chain. A cardioid eccentric cam—that is, an eccentric cam bounded by two arcs of Archimedean spirals—transforms uniform rotational motion into uniform translational motion. The distance between diametrically opposite points on the periphery of the cam is constant. The French mathematician P. de Fermat studied the generalized spiral of Archimedes (ρ/α)n = (Φ/2π)m and found the area bounded by an arc of the spiral extending from the pole to a certain point and by the line joining the pole and this point. The equation ρ = aekφ defines the logarithmic, or equiangular, spiral (Figure l,b). The logarithmic spiral intersects all radius vectors drawn from the pole at the same angle α, where cot α = k. This property of the logarithmic spiral is made use of in designing rotary cutters in order to ensure a constant cutting angle. 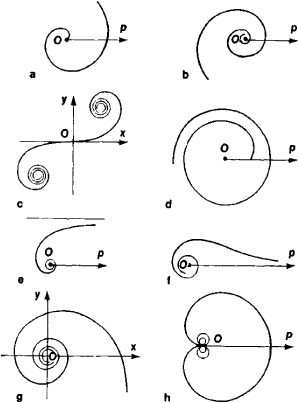 The logarithmic spiral is also encountered in the theory of spiral cases for hydraulic turbines. The theory of gear wheels makes use of the following property: two equal logarithmic spirals rotating about their poles can roll along each other without slipping. Gear trains with variable gear ratios can be obtained in this way. In the stereographic projection of a sphere onto a plane, a logarithmic spiral is the projection of a loxodrome, which is a curve that cuts all meridians at the same angle. The Italian mathematician E. Torricelli determined the length of an arc of a logarithmic spiral: the arc length is proportional to the difference between the lengths of the radius vectors of the end points of the arc; more precisely, the arc length is (ρ2 ρ1))/cos α. The Swiss scientist J. Bernoulli showed that the evolute and caustic of a logarithmic spiral are logarithmic spirals. When a logarithmic spiral is rotated about the pole, the curve obtained is homothetic to the original curve. Under inversion with respect to a circle, a logarithmic spiral is transformed into a logarithmic spiral. The Cornu spiral is an ideal transition curve for use in railroad tracks, since the spiral’s radius of curvature increases in proportion to the arc length. where si(t) and ci(i) are known as the sine integral and cosine integral, respectively. The curvature of this spiral is an exponential function of the arc length. Such spirals are used in french curves. Reminiscent of a spiral is the cochleoid (Figure l,h), whose equation is φ = (α sin φ)/φ. This curve passes through the pole an infinite number of times, and each succeeding loop lies within the preceding loop. Spirals are encountered in the study of singularities of differential equations (seeSINGULAR POINT). Space curves that make an infinite number of circuits about an axis, for example, the helix, are also sometimes referred to as spirals. What does it mean when you dream about a spiral? A simple curve in the plane which continuously winds about itself either into some point or out from some point. A continuously wound reinforcement in the form of a cylindrical helix. A maneuver in which an airplane descends rapidly in a steeply banked turning flight path. The angle of attack remains within the normal range in a spiral. The aircraft speed tends to increase unless other-wise controlled by actions such as throttling back and/or using airbrakes. P&GJ: Do more companies prefer to use spirally welded steel and what is the advantage? In all genera studied (Table 1), the spikelet consists of an indeterminate rachilla, and spirally to distichously arranged glumes, each subtending (or not) a bisexual (or unisexual) flower (Figs. 5 mm long, 2-3 mm wide, acute to acuminate at base and apex; scales somewhat spreading, loosely spirally arranged, with 0-1 sterile scales at the base of the spikelet (excluding the prophyll) and 14-25 fertile scales; fertile scales 2. The cost for a basic extrusion line to produce spirally wound pipe is about 1. Asci with biseriately arranged spores and spirally arranged ridges in semi-mature spores are also features shared with C.
The Zimmer PowerStop has a spirally grooved piston for the passage of the damping oil from the lower reservoir to an exhaust channel. You'll see the spirally Jenny, of course--because that's what Jenny does best. Heli-Tube Spirally Cut Polyethylene Cable Wrap and abrasion Protector can be easily installed by hand over any section of hose that may be subject to chafing. The effect is created by spirally curved, inward-pointing needles that twist covetously around the plant's flexible stems--cascading locks on a seemingly restless tree. The building, it should be noted, is built of steel rein forced concrete and masonry throughout, supported by narrowly spaced, spirally reinforced concrete columns varying in thickness from 14 to 21 inches, with the larger columns, naturally, to be found in the first story. Based on this, the PM would select a developer who had a demonstrated track record of working with laboratories to spirally develop a system along such potential technology paths. Acquisition transformation: lead into gold? MARK Hill, hairdresser of the year, tells us: "Sarah's naturally curly hair has been teased into beautiful ringlets by taking sections of her hair and wrapping them spirally round the barrel of large tongs to produce this soft effect.